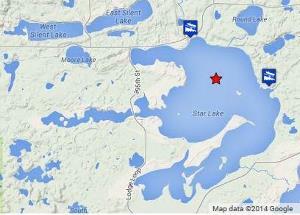 Star Lake is a beautiful lake located west of Dent, MN, in Otter Tail County. There is a large main body of water and three bays (North Arm, West Arm and South Arm). Each area of the lake is unique. Star Lake is known as a good all around fishing lake and also offers a variety of recreational activities. The lake is shared by year round residents, seasonal cabin owners, resorts, and a bible camp. There is a good balance of developed and undeveloped property. Star Lake is one hour from Fargo, ND and about 3-4 hours from Minneapolis/St. Paul, MN. SUMMER months are, undoubtedly, when you see the most people enjoying Star Lake and all it has to offer. It is a great location for summertime activities such as fishing, swimming, skiing, pontooning and boating. Star Lake offers spectacular views of the sunrise, sunsets, the moon glimmering over the lake and awesome star gazing. You can listen to the call of the loons, see eagles soar, watch the geese and ducks with their little ones, and simply enjoy all that nature has to offer. It is a place many call home as well as a great escape for a summer vacation. FALL is a beautiful time of year on Star Lake with all the trees, especially the maples, displaying their color and splendor. Come Labor Day, things begin to quiet down as the tourist season winds down, snowbirds start heading south and kids are heading back to school. Loons and swans are often the last to leave the lake. Fall fishing can be very good and you usually can have your favorite fishing hole to yourself. Maplewood State Park is just 4 miles west of Star Lake and is great place for a hike or fall color drive. There is nothing more relaxing that sitting around a lakeside bonfire on a cool autumn day. WINTER on Star Lake may seem endless and cold, but there are many activities one can enjoy during this time of year as well. Ice fishing and spearing are very popular, and there is also snowmobiling, cross county skiing and snowshoeing on the lake or at nearby state parks. For those that remain on the lake throughout the winter, they simply enjoy the quiet beauty of the lake. When the trees glisten on a crisp, cold, sunny morning it is truly beautiful. Watching our feathered friends at the feeders is also a popular winter past time. SPRING never seems to come soon enough. After a long, cold winter everyone looks forward to seeing the brilliant blue of open water. Ice watchers from around the lake report daily on the ice conditions and when there is a consensus of no ice on the main lake and its arms, "Ice Out" is declared. Spring is also when we see the return of migratory birds, docks and lifts go in the water, the trees start to bud, tulips bloom and the life on and around the lake comes alive with the warmth and magic of spring time. For many, the transition from spring to summer is marked by the fishing opener in May. To view historical information about the Star Lake area, see this material that was presented at the 2017 SLPOA Annual Meeting. Star Lake has a special fishing regulation for Sunfish: Possession limit 10. Below is a handy Length to Weight converter that can be used to convert the length of your catch into the approximate weight. 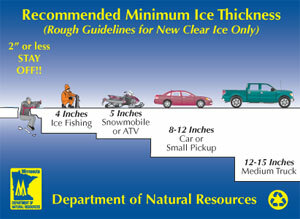 If you see a fish and game violation: PLEASE CALL TIP: 800-650-9093.